March is the time to grab a shamrock! 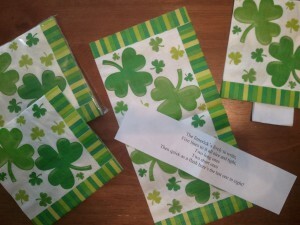 Hide limerick strips inside St. Patrick’s Day paper napkins and let students find them. Now that the calendar has turned to March, it’s time to grab a shamrock and get ready to share the luck and laughter o’ the Irish to help kids learn. No need to BE Irish to teach with Irish themes in classrooms worldwide. So…march your way to St. Patrick’s Day on March 17 with eye-catching activities that support lesson plans and classroom management. Find a Hidden Limerick – Surprise your students by placing a St. Patrick’s Day napkin on each student’s desk or table space before class starts. Hide a folded limerick strip inside each napkin. When kids come in, challenge them to find a hidden limerick somewhere near where they sit. Explain, if children don’t already know this, that the limerick is a kind of poetry that originated in Ireland and is now enjoyed worldwide. As soon as one student discovers a limerick by unfolding her/his paper napkin, everyone will catch on to the fun! Note: Packages of 24 small napkins are available at dollar stores, at least in the US. Another option is to substitute folded sheets of green paper for the napkins. Save paper when you make copies of your limericks by typing limericks multiple times on a single master; then cut your limerick strips. Share limericks, like the ones I’ve written below, that focus on topics that suit your curriculum. The Limerick’s Lively to Write – Introduce students to Irish poetry writing by giving them a limerick strip that teaches how to write a limerick. Explain that in a limerick, the long first, second, and fifth lines rhyme with each other. In a limerick, the short third and fourth lines rhyme with each other, as well. Then quick as a flash here’s the last one in sight! Only when we work hard to be lucky. 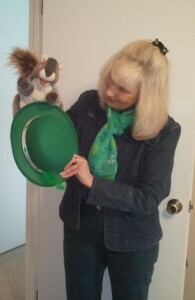 Hand Out a Limerick with a Hand Puppet – Catch kids’ attention by slipping a furry puppet, like a squirrel, on your hand and making it “come alive” behind a St. Patrick’s Day hat. Slip a furry hand puppet, like a smart squirrel on your hand to share a limerick. Use a St. Patrick’s Day hat for your stage. Who says you need a puppet stage to put on a mini puppet show! Students will love this limerick. Notice that it mixes important matters, like learning and using good conduct, with fun. Where we use more than one good conduct rule. Each and every week day. Truth be told, though, vacations are cool! Share a Bit o’ Irish Laughter – Take students “over the rainbow in search of a pot o’ silly (not gold)” with a limerick that helps kids learn rhyming words. She lived in a red house on a hill. In winter snow Jill went sledding for a thrill. 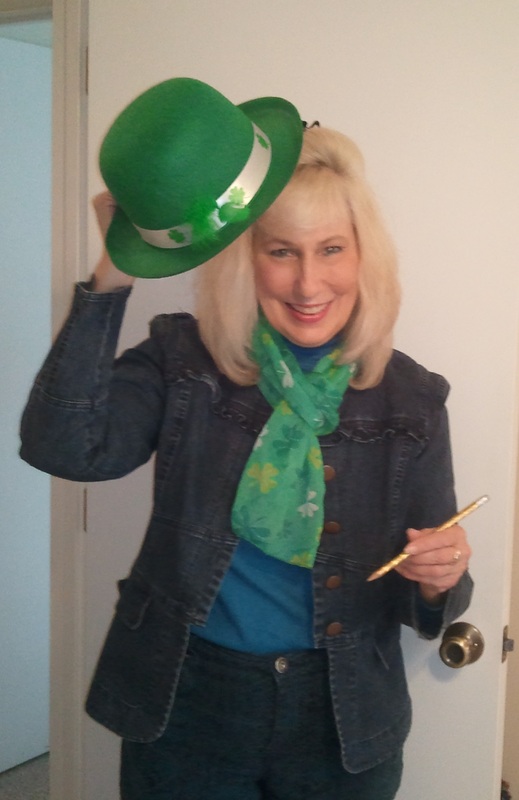 Speaking of silly, St. Patrick’s Day costumes, including funny eyeglasses and green hats make great props for leading into storytelling and story writing time during the month of March. Hats Off for Story Writers! – When it’s writing time, grab a green hat and a pencil and announce that you want to show appreciation for students’ hard work with the writing process as they prepare to write stories or poems. In the Irish tradition, encourage students to choose a focus that connects with St. Patrick’s Day, such as a story about a leprechaun’s adventures. As you reach for a story to share with the class, surprise students by slipping on a pair of giant green glasses. Eyes on Good Readers! – As you invite young students to come to your storytelling circle, don a pair of extra-large eyeglasses to share more Irish luck and laughter. Remind students how lucky they are to have access to books and be able to learn to be good readers. As their teacher, you’ll look funny wearing a St. Patrick’s Day hat and extra-large eyeglasses. Smile for a pretend (or real) camera. Please Pass the Giant Green Glasses – Save the giant green eyeglasses for other activities during the school year. For example, at reading time well past St. Patrick’s Day, let student volunteers wear the glasses when they take turns reading aloud. 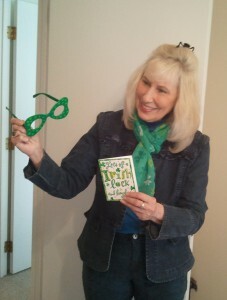 Sharing a bit o’ Irish luck and laughter with easy instructional activities is a fun and functional way to help kids learn.